Other classic beer games like Landmines and Civil War can also be played using the perfectly plastic wrapped sets. 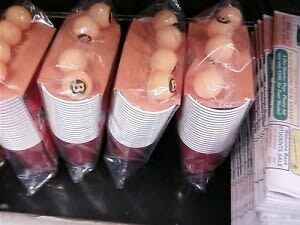 They come complete with two stacks, each stack containing ten, red plastic Solo cups and four orange balls labeled with the letter B on them. It's uncertain where we can find these college worthy gifts but to start check your local stack of newspapers. Now the only thing needed to begin getting drunk and to get this game started is a table!